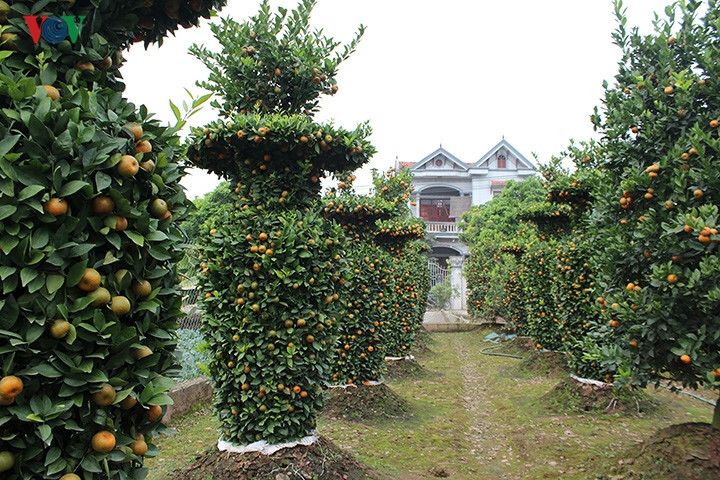 With the Lunar New Year festival (Tet) just around the corner, a kumquat tree garden in the northern province of Hung Yen has been inundated by customers seeking to buy bonsai kumquats trimmed to resemble giant vases. To meet the increasing demand for bonsai kumquats, artisan Nguyen Trung Thanh in Van Giang district, Hung Yen province,has created some unique creations which have been shaped like giant vases. Each bonsai kumquat is about 3 metres in height with a diameter of 1.2 metres. According to the gardener, the bonsai kumquats are meticulously trimmed with each one taking at least 4 days for the kumquat tree to resemble a giant vase. Additionally, all ancient kumquat trees must be planted for 5-7 years with a wide leaf canopy. Herbicides are not used in the process of planting the kumquat trees. A beautiful pair of bonsai kumquats must take on a good shape with both ripe and green fruits. Bonsai kumquats enjoy a high profit margin with a pair of bonsai kumquats priced at around VND50 million. These days, customers visit the garden looking specifically for a bonsai kumquat. Small bonsai kumquats which range between VND500,000 to several million Vietnamese dong are also available to purchase. A local resident from Bac Ninh visits the garden to select a bonsai kumquat for the upcoming Tet festival, wishing for a prosperous and lucky new year.